Hilo has its own set of highlights that you cannot find anywhere else on the Big Island. These include both great restaurants ather places where you can find local specialties, but also many exciting adventures within a one hour drive. 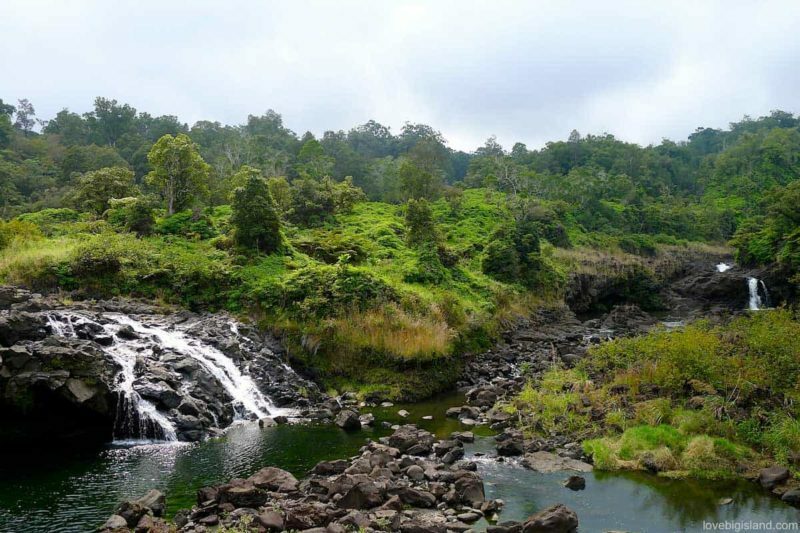 Hilo lies on the newest side of the island, and a short drive to the south-west takes you to the Puna district with many volcanically heated hot ponds and good access to the lava flow. See our complete list of things to do in Hilo to explore all your options. Stargazing is a fun option if that’s your thing (it is ours!). The drive up saddle road to the Mauna Kea visitor center is not that long and possible for all cars. The visitor center organizes free stargazing most nights. Going up all the way to the summit requires more preparation or taking a tour. Read more in our Mauna Kea visitor guide. The surroundings of Hilo are extremely lush because of the high amount of rainfall. 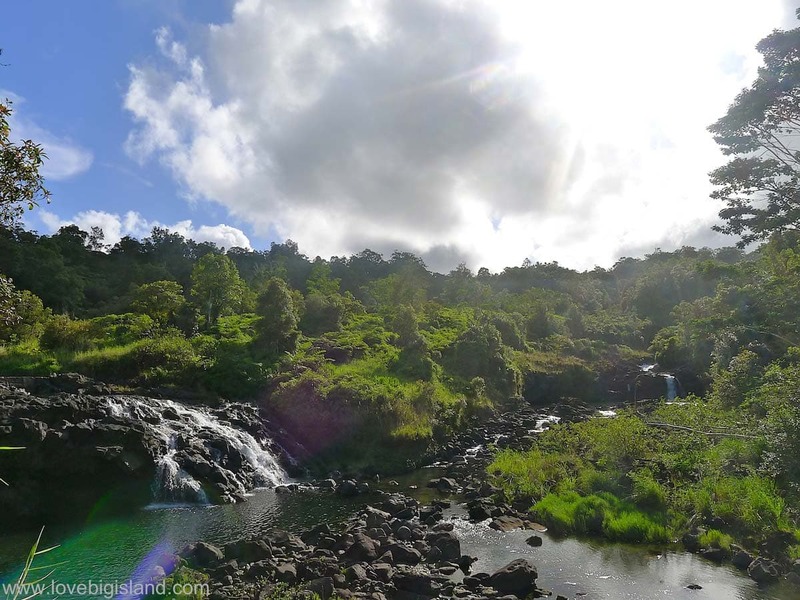 Take the time to see one (or both) of the extremely scenic drives close to Hilo: Onomea (or pepe’ekeo) scenic drive just north of Hilo and the Kapoho Kalapana road in Puna. The last scenic drive will take you past a few hot ponds that are heated by the volcano! You also should try to see at least one of the four spectacular waterfalls in (or close to) Hilo. If have more time, or want to spend the day going to Kona, drive up further north to explore the Hamakua coast. Hilo has good access the lava flows that run down the slopes of the Kilauea volcano into the ocean. In a bit less than 1 hour you can drive from Hilo to the Kalapana lava viewing area. Make sure to read our lava viewing guide if you plan to go see the lava because there is a chance that you won’t be able to see active lava on the surface. The Hawaii Volcanoes National Park entrance is a 45 minute drive from Hilo following Hwy 11 until just past the enchanting Village of Volcano. The park is a great way to get to know the volcano and we think of it as the #1 “must visit” destination in the entire state of Hawaii! 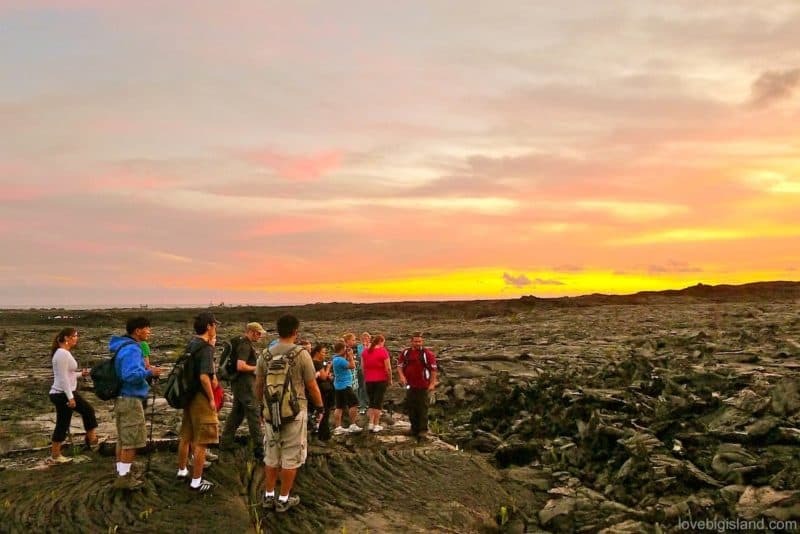 Hiking tours to the lava flow can be tenuous but are worth every drop of sweat you shed! 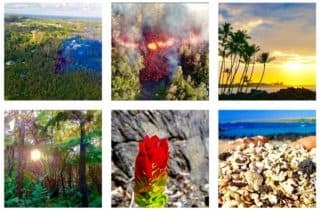 Hilo is the most popular departure point for helicopter tours for a good reason: tours departing from Hilo Airport can take you to see the tropical waterfalls and the active lava fields in under one hour. This short flight-time makes the tours that depart from Hilo cheaper than the lava helicopter tours from the west coast of the Big Island. Read more about Helicopter tours from Hilo. 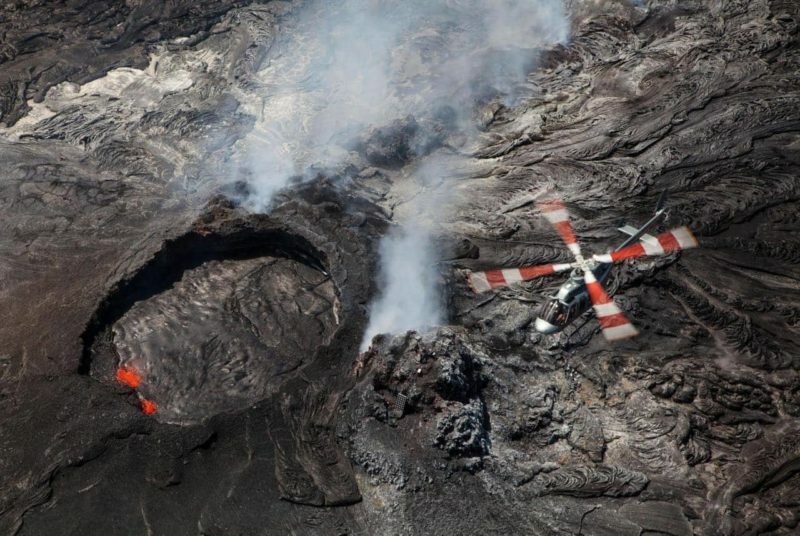 A helicopter from Paradise Helicopters flies over a lava lake. It’s easy to find good local food in Hilo and one thing you should try to taste is the strawberry mochi from two ladies kitchen. The Hilo farmers market is another good and central place to pick up fresh produce and good souvenirs for the people back home, and have you ever heard of a “loco moco”? The loco moco is a favorite local style dish with steamed rice, a hamburger patty, fried egg and brown gravy. You can find them in many (if not all) restaurants but cafe 100 is the place where the loco moco was first conceived and now serves over 30 different varieties. You can find more of our local recommendations for places to eat at the Restaurants in Hilo section.